It is ten years almost to the month since the Daresbury Synchrotron Radiation Source (SRS) closed in 2008. Now in semi-retirement in my mid 60s, it is perhaps an appropriate time to reflect on my time at Daresbury; why I started working there in 1987, what I achieved, and how it led on to future projects after the SRS closed. My early scientific career from PhD days for the next 12 years focussed on gas-phase high-resolution spectroscopy. My PhD work (1975-1979) used a home-built SISAM (Spectrometre Interferential a Selection par l’Amplitude de Modulation) interferometer working in the near infra-red (c. 1-2 μm) to record and analyse the high resolution (c. 0.2 cm-1) electronic spectra of the HO2 and DO2 free radicals. I do not know how to interpret the fact that the two papers that resulted are my highest cited papers [1,2]. These were my first ‘lead author’ papers, and from memory I wrote most of the text. Were these papers really that good, or a fact of life that spectroscopic papers take a long time to be appreciated, or like the archetypical pure mathematician I simply have gone downhill since my mid twenties? Since discovering this fact three years ago, I regard citation data with a certain amount of scepticism and suspicion! My post-doc and independent researcher years (1978-1988) started with Alan Carrington in Southampton, continued through a College independent Research Fellowship and a SERC Advanced Fellowship at Cambridge, and into my early years in Birmingham. In Southampton I built a supersonic beam machine to study the electron impact ionisation of cold gas-phase molecules, detecting subsequent fluorescence from excited electronic states of molecular cations . Again, this project was spectroscopic in nature, the differences from my PhD project being that I studied charged free radicals (i.e. cations, not neutral species), and I discovered the joys, delights (and sometimes tears) of working with home-built electron ionisation sources and supersonic beams. Thirty to forty years later, two general conclusions from this period of my scientific life emerge. First, an electron beam is a sledgehammer approach to ionise molecules; it is effective but there is usually only very limited energy selectivity, a point that led me to realise that synchrotron radiation and vacuum-UV (VUV) photons could be a more effective way to ionise molecules. Second, supersonic beams and the subsequent cooling of the sample in its vibrational and rotational modes have been a wonderful addition to the experimental tools available to the chemical physicist. But they have not been the universal solution to all gas-phase spectroscopic problems which was predicted by many in the 1960s and 1970s; sometimes they can create as many solutions as they solve. After three years in Birmingham, I was getting bored with electron-impact ionisation of small molecules. Admittedly I had moved on from diatomics and triatomics to 5-atom polyatomics (e.g. CF4 and SiF4 ); big deal, I can hear many say! But I was struggling to define new problems which could be solved with the apparatus I had built. I remember a brief foray into astrochemistry to see if some of the (still unassigned) diffuse interstellar bands in the UV and visible were due to ionised polyaromatic hydrocarbons, but this project was unsuccessful. As so often in life and science, serendipity played the next step. I had observed broad bands in the UV and visible produced from electron impact ionisation of rotationally cold samples of SiCl4 and GeCl4 . 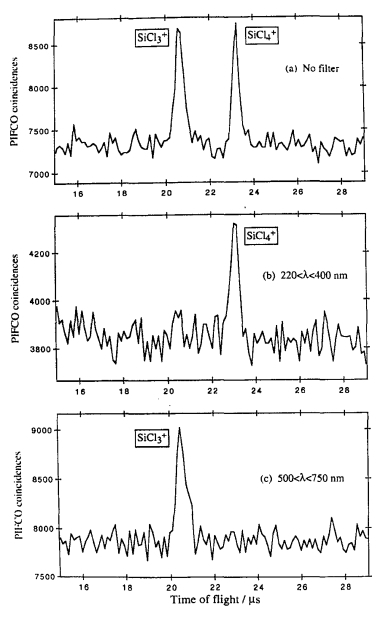 There was no structure in the emissions, so the tools of high-resolution spectroscopy (e.g. combination differences) were unavailable and the bands were unassigned. Soon after, I heard a conference talk from Robert Donovan (Edinburgh) who was a heavy user of the VUV beamlines at Daresbury. Robert was on the interview panel for my successful SERC Fellowship nine years earlier, and I chatted nervously with him at coffee breaks. I am sure Robert will have forgotten this. But being the eternal optimist that he was and remains, he encouraged me strongly to approach Daresbury because this could be the way forward for solving the SiCl4 etc. problem. In early 1987, I therefore approached John West at Daresbury with some trepidation because atomic photoionisation seemed a long way from molecular spectroscopy. John was kindness personified. If I remember correctly, this led him, Andy Hopkirk (then employed at Daresbury) and myself cobbling together from bits and pieces an apparatus that could study the photon-excited VUV excitation of gas-phase samples with undispersed fluorescence as the means of detection. In November we were able to solve the SiCl4 problem ; my first paper in the Journal of Chemical Physics. (In the chemical physics world it still remains a journal where ‘good papers’ are often sent, even if other journals have higher impact factors.) We also studied other molecules of the same size and symmetry (e.g. CF4, SiF4, GeCl4) in that first two-week period of beamtime. Two back-to-back papers were submitted to JCP in spring 1988 and accepted a month later [5,6]. In retrospect, this was the fastest ‘results-to-paper’ turn-round of my career, and I must have been a hopeless new father because our first child was born in January 1988! Discussions with other spectroscopists led me to appreciate that fluorescence from excited states of large polyatomic molecules, be they neutral or charged, was unusual, to say the least, because such states normally dissociate. Serendipity again played a part and John put me in touch with an old friend of his, Keith Codling (Reading). Together we started to study the non-radiative dissociative properties of such-sized polyatomic cations, again produced state-selectively by VUV photon radiation from the Daresbury SRS. A third paper in JCP resulted in 1990 . Paul Hatherly had just completed his PhD in Keith’s group, and we worked together for the next c. 18 years. It was Paul that then designed and built one of the early threshold electron detectors in a multi-purpose coincidence apparatus (more later, §5) , and we used this apparatus extensively until the SRS closed in 2008. These early years at Daresbury indirectly led me, via Sydney Leach (Orsay and Meudon, France) for whom I had enormous respect, into establishing contact with Helmut Baumgärtel (Freie University, Berlin). These two figures remain giants from the early days of gas-phase synchrotron science. A research student in my early Daresbury years, Jeremy Creasey, worked with Helmut for a year in the early 1990s, and through him Helmut and myself established another very fruitful collaboration using the Bessy 1 synchrotron source in Berlin until its closure in 2000 (more later, §3.2.1 and 3.3). In parallel with this collaboration, I was getting increasingly frustrated with the limitations of the medium-resolution 3.1 Seya beamline at Daresbury. It took several years to achieve, but finally myself and John West were successful in winning an EPSRC grant to rebuild this beamline with a higher flux, Wadsworth-type monochromator . This rebuild was completed in 2003, and the beamline was used extensively by my group until the SRS closed five years later. (I note that experiments were possible on this new beamline which could not be achieved at other synchrotron sources used later, and in my opinion this rebuild was an unqualified success. It is a pity that the beamline was not used more often by others in that period of time.) My scientific interests had also broadened into the study of ion-pair formation following VUV photoexcitation of a molecule (i.e. AB + hν → A+ + B-), and in the last few years at Daresbury I had my third major collaboration with the group of Colin Latimer (Queens University Belfast). The closure of the SRS loomed from 2001 onwards, and scientists like me who were using Daresbury as their main source of photons for chemical physics problems had to decide what to do; give up, turn to laser-based experiments in our home laboratory, or go elsewhere in Europe. I rejected the first two possibilities quickly. There were three frustrating years of trying to persuade the CCLRC management that VUV provision should form part of the plans for the new Diamond source being built in Oxfordshire, but they all came to nothing. For me, the obvious possibilities in Europe were Germany (Bessy 2 in Berlin), France (Soleil in Paris) or Switzerland (Swiss Light Source (SLS), part of the Paul Scherrer Institute in Villigen). A six-month sabbatical in 2006 doing different laser-based experiments in the VUV with Frederic Merkt (ETH Zurich), coupled with frequent visits to Villigen 30 km away, convinced me that the SLS was the way to go, and over the years 2008 to 2010 I moved all experimental projects to Villigen. My group have now had a wonderful ten years working with Andras Boedi, Thomas Gerber, Melanie Johnson and Patrick Hemberger. The projects I initially tried only partially succeeded, but I changed directions and have now learnt the joys and delights of 3rd generation synchrotron sources. I would highlight (a) a totally reliable source of VUV photons (which, alas, was never really possible in my 20 years at the 2nd generation Daresbury source), and (b) working at a resolution of c. 1 meV (8 cm-1) or better which could only be dreamt of at Daresbury. I learnt early on that doing experimental science at a synchrotron source imposes a very different discipline to working in a University laboratory. You have to be totally focussed, prepare in advance exactly what you hope to achieve in your beamtime (typically 1-2 weeks for gas-phase chemical physics projects), but also show flexibility and change direction rapidly if something does not work or breaks. ‘Going home and leaving the problem until tomorrow’ does not work at synchrotron sites the world over, and Daresbury was no exception. I also learnt quickly that physicists often have a different mindset to chemists; not better, not worse, just different! What is noticeable, looking at my collaborators over 30 years in synchrotron science, is they nearly all come from a physics background (and are male, but that is a different matter). So the often-quoted chemist mentality of ‘getting something to work on a molecule, then run through the periodic table on different molecules to establish trends’ might get met with blank faces. But for me, I did learn a different approach to science from which I benefitted hugely over my subsequent career. You are not exposed to such differences if you work in your own laboratory in the (Chemistry) department at a University, and I hope the physicists with whom I worked can say the same. You also learnt the joys of working at night at synchrotron sources. Usually with groups of only two or three people, a 24/7 round-the-clock regime would not work for us. So our working hours were typically 9 am to 1 am the next morning, and scans were put on overnight with fingers crossed. The importance of sleep, regular food, and exercise and fresh air whenever possible was quickly established. For me in my later years at Daresbury when I had increased work duties in Birmingham, this was often the six-mile bike ride from Daresbury to the Runcorn train station! Then you had to adapt to a different time regime when you got home after an exhausting fortnight of beamtime often existing in the later stages on adrenalin, and learning to interact again with other people, perhaps your partner and children. I say publicly that I am so glad my partner is not a scientist and does not work in a University! Would I do it again? Definitely yes, it refocused my career. In addition, the working conditions at 3rd generation sources (and doubtless at free electron laser sources that are coming) are so much better than thirty years ago. This is nobody’s ‘fault’, it is simply the progress of science, and I am certain that the early pioneers of the 2nd generation Daresbury source in the 1970s were amazed at how much had improved before its closure in 2008. Never also forget that in this 40-year period of time, email, the internet and social media evolved from nothing to the universal facilities they are now. Finally, one learnt to appreciate at synchrotron sources that you are responsible for your experiment only, and the photons are somebody else’s responsibility. Laser-based experiments in University laboratories do not work like that. It taught me to focus exclusively on what you had control over, and not worry about aspects which were out of your control. For me, this became very obvious when I moved to the Swiss Light Source, where total reliability of the photons being available when you opened a valve became standard; there was no need to ‘worry about the photons’ which, through inexperience, had dominated my mindset in the early Daresbury years. Three major projects summarize my 30 years of synchrotron science; fluorescence experiments, coincidence experiments often involving threshold electron detection, and ion-pair formation. In this article, I only describe the fluorescence experiments because this is where my research at the Daresbury SRS started in 1987, and which evolved via Berlin into the later years using the rebuilt Wadsworth beamline back at Daresbury; I have also never written this ‘review’ before! The coincidence experiments started with the Codling / Hatherly collaboration over the years 1990-2008, and then evolved to much improved resolution in the last ten years at the SLS; they were reviewed in 2017 in a large Perspective article written with Tomas Baer , another of the giants of VUV synchrotron science from the 1970s onwards. The results from the ion-pair project were reviewed extensively by Matthew Simpson, my penultimate PhD student, and myself in 2011 . 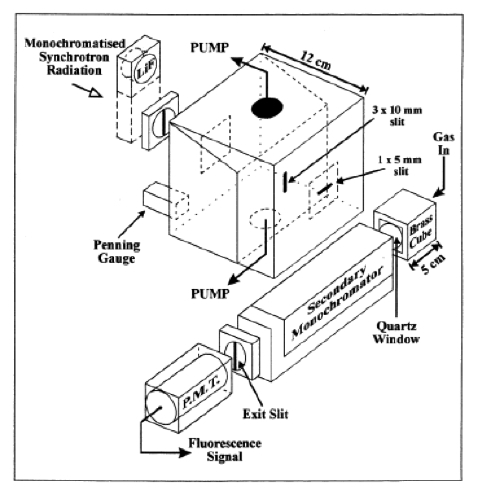 After a few beamtimes using the cobbled-together apparatus ($1), a simple purpose-built apparatus was constructed to study VUV-excited fluorescence excitation spectroscopy of polyatomic gas-phase molecules (Fig. 1). Simplicity arises because the experiments are conceptually easy to understand. To use synchrotron language, they are flux-hungry; the more VUV flux can be delivered to the interaction region where any fluorescence-induced photons can be detected, the more signal is observed. There are no complications; for example, false coincidences being detected in coincidence experiments  or secondary reactions occurring in the interaction region in ion-pair experiments . With no filter in front of the detection photomultiplier tube, all photons in the range c. 200-800 nm can be detected. With an optical filter in place, either a narrow-band interference filter or a cut-on filter, a limited form of action spectroscopy can be achieved. Flux normalisation to the varying amounts of VUV photons coming from the monochromator in the beamline of the Daresbury SRS is performed in situ. Thus the experiment determines fluorescence normalised to the VUV flux, detected from the interaction region over an appropriate region of the UV / visible, as the VUV photon energy hν is scanned. The process is resonant because if the photon energy, hν1, is too low or too high the Rydberg state of ABn is not populated. Thus this experiment gives information on the spectroscopy of Rydberg states of the polyatomic molecule, but only limited data about the spectroscopy of the emitting species. In retrospect, following publication of over twenty papers on this topic for different polyatomic molecules, perhaps the most revealing molecules studied in this way were BF3 where the emission was due to the BF2 radical , and PF3 where emission was mostly due to the PF2 radical . 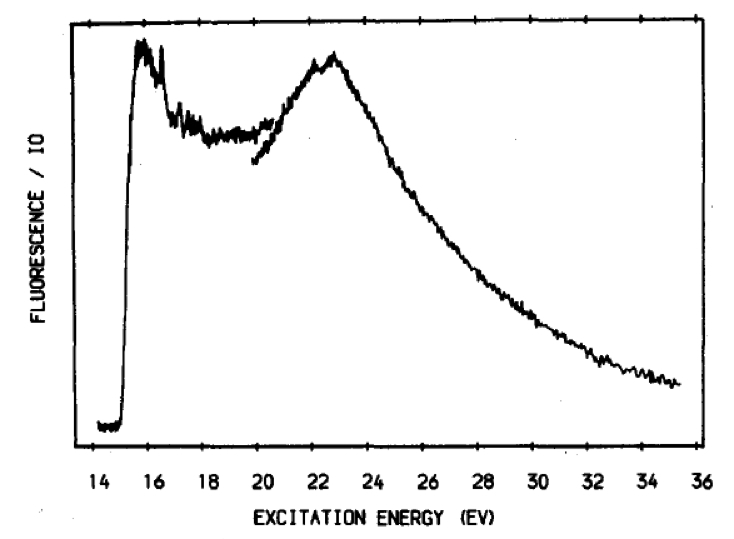 This was exactly the form of the excitation function observed in our first beamtime in 1987 when SiCl4 was excited by tunable VUV radiation , fluorescence being due to the C 2T2 state of SiCl4+ with an adiabatic ionisation energy of 15.1 eV (Fig. 3). Above this onset energy, the fluorescence signal remains non-zero and its intensity is determined by the variation of the partial ionisation cross-section into this fluorescing state of the parent ion with energy above threshold. What these experiments determine is whether a particular electronic state of the parent ion fluoresces. There is, however, no absolute information in these measurements, and in particular there is nothing determined about the value of the fluorescence quantum yield, ΦF, of the emitting state. Here, ΦF is defined by krad / (krad + knonrad) where krad and knonrad are absolute decay rates for radiative and non-radiative channels; it can be regarded as a fluorescence or radiative probability for that excited state of the molecular cation. 3.2.1 Bessy I, Berlin experiments, 1992-2000. These experiments started in 1992, and I must acknowledge the huge help and commitment of Hans-Werner Jochims (alas, deceased 2010) who was Helmut Baumgärtel’s ‘right-hand’ person in synchrotron projects at Bessy 1 until its closure in 2000. This 800 MeV ‘low energy’ synchrotron was one of the best second-generation machines ever built for dedicated synchrotron science, especially with low-energy VUV photons, and as so often this fact is only appreciated many years later. ‘Small is beautiful’ was one of Hans-Werner’s favourite phrases, and the apparatus he constructed for dispersed fluorescence experiments at Bessy 1, Fig. 4, was just that. The tiny 50 mm brass cube was the interaction region where the pressure probably got as high as 10-2 to 10-1 mbar during an experiment, but it was never measured. Induced fluorescence was dispersed by a small Jobin-Yvon 0.2 m focal length (secondary) monochromator and detected by a photon-counting photomultiplier tube. The rest of the apparatus provided the differential pumping so that the brass cube could be attached to the exit slit of the 1.5 m normal-incidence monochromator, one of the VUV beamlines of the Bessy 1 storage ring. This apparatus did have three important characteristics. First, unlike Daresbury it was not possible to flux-normalise fluorescence excitation spectra in situ to the VUV photon beam. So whilst excitation spectra could be recorded with the secondary monochromator set to zero order, a separate experiment had to be performed to achieve flux normalisation; not impossible, but tedious. Second, the secondary monochromator (Jobin Yvon H20VIS for most experiments) had no entrance slit and a wide exit slit of 1-2 mm, giving a resolution of c. 4-8 nm to disperse the induced fluorescence. Thus experiments could disperse the fluorescence after excitation at a fixed VUV (primary) energy, giving low-resolution electronic spectra of the emitting species. True action spectra, where the secondary wavelength was defined (albeit at poor resolution), could also be obtained. Third, time-resolved single-bunch experiments (described in $3.3) could be performed. What made Bessy I superior to the Daresbury SRS for measuring shorter lifetimes (< 5 ns) was the time profile; Bessy I had 20 ps pulses every 208 ns which meant that lifetimes in the range c. 3-100 ns could accurately be measured. By contrast, the SRS Daresbury source had 200 ps pulses every 320 ns, limiting its measurable lifetimes to c. 5-150 ns. The ability of the Bessy I apparatus to disperse the induced fluorescence, in addition to determining the wavelength of the emission and defining the emitter, made it ideal for measuring lifetimes of fluorescing states of neutral free radicals and molecular ions. This is particularly true when more than one emitter was produced at any VUV primary energy. We probably under-exploited this aspect of science that could be achieved. As an example of a molecule studied initially at Daresbury in 1996, then two years later at Bessy 1, then finally by the rebuilt beamline at Daresbury (§3.2.2), Fig. 5 shows the excitation spectrum of PF3 in the range 9-20 eV. The resolved vibrational structure between 9.5 and 12.5 eV corresponds to excitation to Rydberg states of PF3 which dissociate to excited and fluorescing states of the PF2 radical, the only thermodynamic possibility. The structure corresponds to ν2 bending modes of the (8a1)-1 4p, 5p and 6p Rydberg states of PF3. From an earlier Franck-Condon analysis of this spectrum , we estimate that the FPF bond angle in PF3 increases by c. 14o ± 1o upon photoexcitation; that is from 98o to c. 112o. Being less than 120o, the Rydberg states therefore remain of pyramidal geometry. At excitation energies greater than 16 eV, fluorescence is due solely to the PF radical. (d) PF A 3Π - X 3Σ- fluorescence between 300-380 nm for VUV excitation around 16.1 eV. These PF2 assignments are heavily dependent on ab initio calculations. The lifetimes of the bent 2A1 and quasi-linear 2B1 (2Π) states of PF2 are 14.7 and 7.9 ns, respectively, whilst those of lower-lying excited states of PF2 are too long to measure . Twenty years later, this work remains the most extensive experimental study of the valence spectroscopy of the PF2 radical. 3.2.2 SRS Daresbury experiments, 2003-2008. The new monochromator on beamline 3.1 of the SRS had Wadsworth design, replacing the 20 year old monochromator of Seya design. It became fully operational in 2003, but alas was only used for five years until the SRS closed in 2008. The design and preliminary results from commissioning experiments were published in 2005 . Although many calculations were done when submitting the EPSRC grant application, it was impossible to quantify accurately the improvement in flux between the two monochromators, but we believe it was at least two to three orders of magnitude. In brief, the Wadsworth monochromator contained only one concave diffraction grating (Fig. 7), whereas the Seya monochromator had concave mirrors positioned before and after the entrance and exit slits. The Wadsworth also had no entrance slit, so it made efficient use on a bending magnet of the full horizontal aperture of the beamline. The instrument operated in horizontal dispersion, so its resolution was limited only by the horizontal electron beam size in the storage ring, FWHM c. 1.8 mm, corresponding to an optimum resolution of 0.05 nm. Although this was significantly inferior to that which could be obtained using vertical dispersion, it was appropriate for the ‘medium resolution’ VUV experiments envisaged and, more importantly, led to a much more convenient experimental arrangement. Two gratings, interchangeable under vacuum, gave a wide wavelength coverage of 40-200 nm; the high-energy grating, 2400 lines mm-1, covered the range 40-100 nm, the medium-energy grating, 1200 lines mm-1, covered best the range 80-200 nm. The absolute photon fluxes from the two gratings, measured at the exit slit of the monochromator, are shown in Fig. 8. They are within 50% or better of the calculated values. The prominent peaks at short wavelength are to be expected from gratings with lamellar rulings. The amount of second- and higher-order radiation was greater than calculated, but still less than c. 10%. However, a lithium fluoride window rejected these components efficiently when operating with a first-order wavelength greater than c. 105 nm. A new apparatus, Fig. 9, was built to mount onto this new beamline to study dispersed fluorescence from VUV-excited gas-phase molecules. A black-anodised aluminium cube of side 120 mm was attached to the post-focussing mirror box which itself attached to the exit slit of the Wadsworth monochromator . The cube was partitioned into two separate sections divided by a 3 x 10 mm vertical slit which could be controlled by a vacuum-tight slider. Like the German apparatus, a small brass cube of side 50 mm was connected to the aluminium cube, separated from it by a 3 mm diameter aperture. This arrangement allowed extensive differential pumping to occur; the operating pressure in the interaction region was c. six orders of magnitude higher than in the post-focussing mirror box, thereby preserving the gratings in the Wadsworth monochromator. Fig. 9. Two-stage differentially pumped fluorescence apparatus used on the new Wadsworth monochromator at Daresbury from 2003-2008. 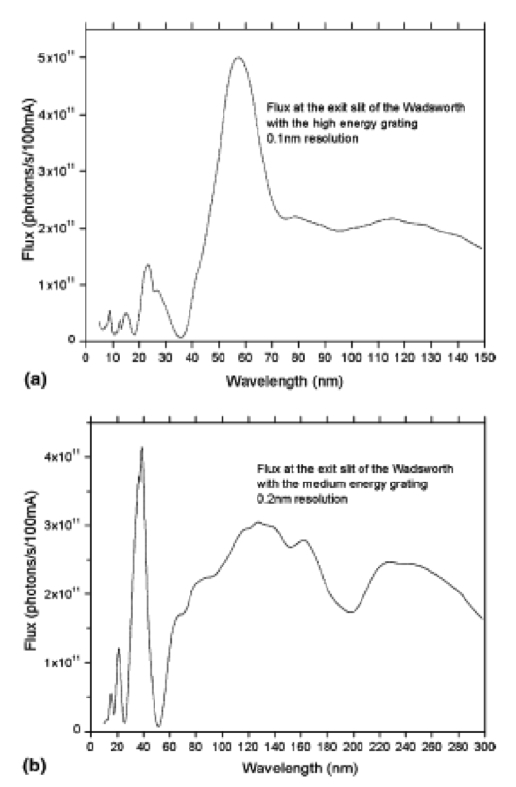 A sodium salicylate window was used for in situ flux normalisation to the VUV photon beam. Fluorescence from the small brass cube was either detected undispersed by a photomultiplier tube, or dispersed via a UV fibre bundle through a Triax 0.2 m monochromator onto a CCD multi-channel detector. The main improvement over the BESSY I apparatus was the use of a charge-coupled device (CCD) detection system. This multi-channel detector permitted the measurement of a wide range of wavelengths simultaneously, as opposed to the configuration at BESSY I where a grating scanned a defined spectral range and successive wavelengths focussed through the exit slit on to a photomultiplier tube. In essence, the CCD could attain the same signal-to-noise ratio as that achieved by a single-channel detector in a much shorter acquisition time, i.e. the Jacquinot advantage . Two studies highlight the improvement that this upgrade produced. First, perhaps the best example relates to the BF2 free radical following VUV excitation of the BF3 molecule. This system was first studied using the Seya monochromator at Daresbury in 1993 , and some low resolution dispersed spectra were recorded at Bessy 1 in 1999 . The excitation spectrum recorded with the upgraded 3.1 beamline at Daresbury is shown in Fig. 10 . This spectrum has similar signal-to-noise ratio to spectra reported previously. However, the dispersed spectra when BF3 is excited at 13. 1 eV (the (3e’)-13s Rydberg state), 14.1 eV (the (1a2’)-13p Rydberg state) and 15.7 eV (the (3e’)-14s Rydberg state), Figs. 11, 12a and 12b, are vastly superior to those recorded earlier at Bessy 1. Furthermore, Fig. 13 shows the dispersed fluorescence spectrum at 14.1 eV with improved resolution, this result only being achievable through the enhanced flux of the VUV beam and improved detection system. The resolved peaks are almost certainly due to bending progressions in the BF2 B 2A1 - X 2A1 and B 2A1 - A 2B1 bands, with these assignments reliant on ab initio calculations of Peric and Peyerimhoff that accompanied the initial study . The observed line positions, listed elsewhere , constitute two progressions; the first major one has an average spacing of 520 ± 20 cm-1, the second weaker one at higher wavelengths having an almost identical spacing of 526 ± 20 cm-1. It is not clear whether these progressions are due to the bending vibrations in the B state or the lower-lying X and A states. Surprisingly, no discrete structure was observed for excitation of BF3 at 13.1, 14.7 and 15.7 eV, despite the experimental conditions being identical. Second, a similar improvement was observed for dispersed spectra following VUV excitation of BCl3, first studied in 1993 . Fig. 14 shows the dispersed spectrum following photoexcitation at 17.7 eV, but now the assignment is due to an electronic transition in the cation BCl2+. This spectrum was first observed at Bessy 1 in 1995 with a similar signal-to-noise ratio . The excitation function with a threshold at 16.7 eV was very similar to that of non-resonant parent-ion production (see Fig. 2). However, the emitter cannot be the parent ion of BCl3 because no electronic state of BCl3+ is observed in the photoelectron spectrum at this energy. On thermodynamic grounds the most likely emitter is BCl2+, and coincidence experiments have established that the ground state of BCl2+ appears at c. 12.3 eV . Energetics therefore would suggest that the emission is due to an electronic transition in this ion where the excited state has a threshold of 16.7 eV. This has previously been assigned to the BCl2+ A - X transition, with the vibrational progression of 650 ± 30 cm-1 being due to the ν2 bending mode of the ground or excited state . Again, the point made here is that such a spectrum could only be recorded due to the larger flux from the VUV beamline and the improved sensitivity of the multi-channel CCD detector. Radiative lifetimes of fluorescing states could be measured using the single-bunch mode of the synchrotron source, be it Daresbury or Bessy 1. That is, one bunch of electrons only is present in the ring, and the next bunch is injected to coincide with the preceding bunch. The range of lifetimes measured span c. 5-150 ns at Daresbury (the transit time around the circumference of the larger ring being 320 ns), but slightly less, c. 3-100 ns, at Bessy 1 because the ring was physically smaller with a transit time of only 208 ns. At Bessy 1, the lower limit was imposed by the time response of the photomultiplier tube and associated electronics, the upper limit by the 4.8 MHz repetition rate of the source. Although the range of lifetimes that could be measured was relatively limited at either source, data collected quickly due to the high repetition rate. Best results were achieved at Bessy 1 because both the VUV excitation energy (E1) and the emission fluorescence wavelength ( λ2) were defined. Therefore, the emitting fragment or cation is defined by λ2, important when more than one emitter is excited at a particular value of E1. The decay of fluorescence in real time was recorded using a time-to-amplitude converter and a multichannel analyser mounted in a dedicated PC. The method of analysis of the time-resolved decays used the program FLUOR developed by staff at the Daresbury Laboratory . To illustrate what could be achieved, the lifetimes of the different emitters from VUV-excited BCl3 in the range 9-21 eV measured at Bessy 1 are described. Many different emitters are produced over this range of energies, emissions being due to BCl2*, BCl, BCl3+, BCl2+ and B atoms, and E1 and λ2 are set accordingly. Full details are given elsewhere . Experimental decays from emissions in BCl, BCl3+ and B atoms, to take three examples, are shown in Fig. 15 and the results in Table 1. They comprise a more comprehensive set of lifetimes than those measured in earlier work at Daresbury where the emission wavelength was not defined . The ability to define λ2 is particularly important for this molecule for E1 > 15 eV where several emitters are excited simultaneously. Some of the decays fit to both single and double exponentials (Table 1). The single-exponential values only are quoted in the main table, either because a single lifetime value is expected or because one component in the double-exponential fit has an unacceptably high error. It is probably fair to comment that the use of single-bunch mode at second-generation synchrotrons, with the possible exception of the Super-Aco source in Orsay France, was underused by user communities in both the UK and Germany. Fig. 15. Decay of the fluorescence following excitation of BCl3 at (a) 15.5, (b) 16.0 and (c) 20.6 eV with single-bunch radiation from the BESSY 1 source. The secondary monochromator is set to the λ2 value shown, and the emitting state is shown. Each spectrum shows the experimental points, the prompt signal (broken curve), and the fit to the data (full curve) using the method described elsewhere . The time calibration is 0.3947 ns per channel. Table 1. Lifetimes of emitters selectively formed following VUV excitation of BCl3 in the range 9-21 eV. a We estimate that a flat decay over the lifetime of the experiment, 208 ns, implies τ > 500 ns. b Very small but definite fall in signal over the lifetime of the experiment, 208 ns. We estimate only that τ < 500 ns. c Can also be fitted to a double-exponential function with a reduced Χ2 value, with τ1 = 21 ± 3 and τ2= 61 ± 21 ns. d Can also be fitted to a double-exponential function with a reduced χ2 value, with τ1 = 4.1 ± 0.4 and τ2 = 16 ± 1 ns. e Notation and ordering of excited states of BCl2* are given in C2v symmetry . Many synchrotron sources have been used to determine absolute absorption cross sections of polyatomic gas-phase molecules in the vacuum-UV, but nearly all such measurements have been limited to photon energies below the lithium fluoride cut-off of c. 11.8 eV (i.e. wavelengths above c. 105 nm). With this limitation imposed, an absorption cell with LiF windows can be used, and the path length is clearly defined. A variation was built by Jochims, Fig. 16, so that absorption spectra could be recorded at much higher VUV energies, indeed the range only being limited by the photons deliverable from the beamline . The entrance ‘window’ consisted of a 1 mm thick stainless steel microchannel plate with hundreds of very small holes, so a pressure differential of 1000:1 across the microchannel plate was possible. This plate could transmit wavelengths well below 100 nm, allowing absorption measurements to be made at such low VUV wavelengths, and yet the path length of the absorption cell, L, was accurately defined. Absorptions could therefore be put on an absolute scale through the Beer-Lambert law. Although spectra from this project have been reported in several papers, results for the molecules MCl4 (M = C, Si, Ge) and CF3X (X = F, Cl, Br, H) have been written up in a PhD thesis and await publication . Fig. 16. 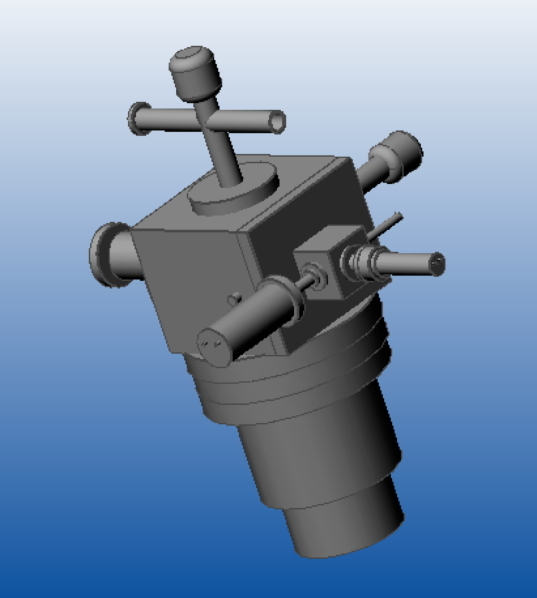 Apparatus to determine absorption cross sections over the complete range of the vacuum-UV, c. 10-30 eV. The 1 mm thick microchannel plate has a large number of minute holes, allowing both at least a 1000:1 pressure differential across the plate to be possible and the path length of the absorption cell, L, to be defined. At the same time as the fluorescence projects were pursued at Daresbury and Bessy 1, my group collaborated extensively with physicists at the University of Reading to study non-radiative processes in polyatomic cations at Daresbury. From 1993 onwards, we used a unique apparatus, Fig. 17, designed by Paul Hatherly to study predominantly Threshold PhotoElectron PhotoIon COincidence (TPEPICO) spectroscopy . In retrospect, it was more advanced than was appreciated at the time, and now could be described as incorporating one of the first position-sensitive detectors to study fragmentation processes in gas-phase polyatomic cations . However, in the design phase we also included the possibility of studying COincidences between Fluorescent photons with either Threshold PhotoElectrons (TPEFCO spectroscopy) or PhotoIons defined by their flight time from point of production to detector (PIFCO spectroscopy). Interchange between the three coincidence experiments was conceptually very simple, in practice slightly more difficult to achieve. We did not, however, use the apparatus much to study coincidence spectroscopy using fluorescent photons, simply because photon emission from excited states of polyatomic ions lying above the energy of one or more dissociation thresholds is rarely observed. The evolution of TPEPICO spectroscopy from conception in the late 1960s to where the technique is now fifty years later has recently been described by Tomas Baer and myself . Here I describe what PIFCO and TPEFCO spectroscopy can achieve, with one example of each from my time at Daresbury. Fig. 17. Schematic of the apparatus used at Daresbury from 1993-2008 which can perform threshold photoelectron photoion coincidence (TPEPICO), photoion fluorescence coincidence (PIFCO) and threshold photoelectron fluorescence coincidence (TPEFCO) spectroscopies. Fluorescence from excited state of polyatomic ions when dissociation channels are energetically open can be regarded as a manifestation of non-statistical, ‘isolated state’ behaviour . 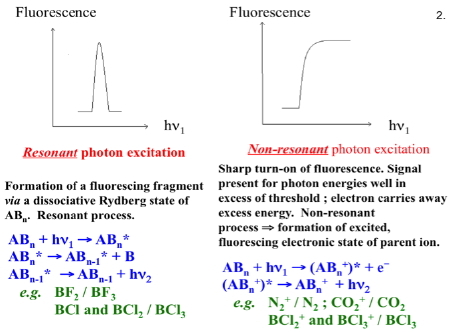 PIFCO (PhotoIon Fluorescence COincidence) spectroscopy can determine the lifetime, τ, and fluorescence quantum yield, ΦF, of the fluorescing state of the ion, but these values are averaged over the Franck-Condon populations of vibrational levels of the fluorescing state. Lifetimes can of course be determined at much improved resolution and accuracy by single-bunch measurements ($3.3), but no information is obtained on the radiative probability which is what ΦF measures. More of interest to us, by observing which ion is detected in coincidence with the photon, the fate of the lower electronic state to which fluorescence occurs could be determined. 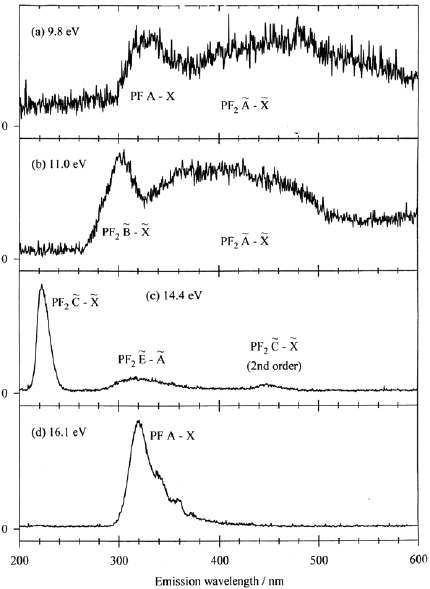 An example is the C 2T2 state of SiCl4+ with a threshold energy of 15.1 eV, by pure accident the first molecule which we studied at Daresbury by fluorescence spectroscopy ($3.1). This state fluoresces in the red region of the visible to the repulsive A 2T2 state which dissociates rapidly on a sub-picosecond timescale to SiCl3+. The state also fluoresces in the UV region to the bound ground X 2T1 state of SiCl4+, so now coincidences are observed between photons and SiCl4+ ions only. Fig. 18 shows clearly that which ion is observed in coincidence with the photon depends on which region of the UV / visible fluorescence is detected. Full details are given elsewhere . 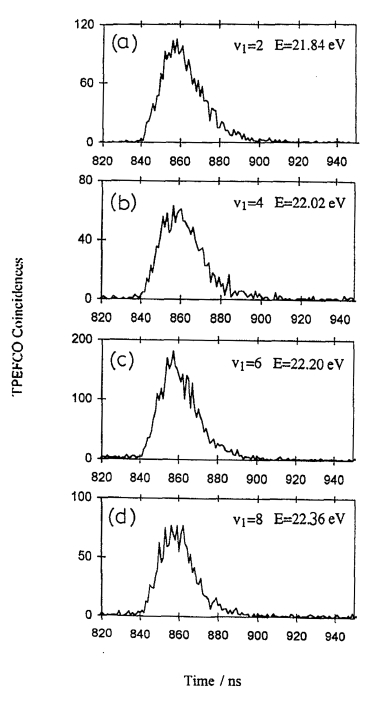 TPEFCO (Threshold PhotoElectron Fluorescence photon COincidence) spectroscopy can also determine τ and ΦF but, with sufficient resolution in the photon source and electron analyser, vibrational state selectivity of the fluorescing state can be achieved. Changes of τ and ΦF with vibrational level are most interesting because they can be attributed to a change in rate, possibly even onset, of a competing dissociation channel. An example is the C 2T2 state of CF4+ with threshold energy of 21.7 eV, Fig. 19. By observing that tv decreases as v increases (values in the figure caption), ΦF must also decrease as v increases. Assuming that the CF3+ to CF2+ signal strengths, values taken from the coincidence yields in the TPEPICO spectrum, is a direct measure of ΦF through (ΦF)v / (1-(ΦF)v), absolute values of (ΦF)v can be determined for v1 values spanning 0-10. The values decrease from unity to c. 0.5. The change is limited because dissociation to CF2+ (+F2 or 2F) must involve intramolecular vibrational redistribution within the CF4+ state. This is a slow process because the ν1 (a1) C-F stretching vibrational mode does not couple strongly with the ν2 (e) bending mode. Again, full details are given elsewhere . This article has summarised one of the three projects that was pursued by my group and many collaborators at the Daresbury SRS in my 21 years there before the source closed in 2008. The other projects, on ion-pair formation and on threshold photoelectron photoion coincidence spectroscopy in the vacuum-UV, are reviewed elsewhere [11,9]. The TPEPICO project developed significantly with improved resolution and beam stability at the 3rd generation Swiss Light Source at Villigen, Switzerland in the ten years following the SRS closure. I have enjoyed these thirty years enormously. Of course, there were both good and poor beamtimes, but with age and experience one learnt to adapt to difficulties and consequential frustrations. I have no doubt that much of this work will be improved by others in the next 20-30 years, but that is the way all areas of science evolve. Finally, many thanks to my research group for three decades for putting up with me, collaborators in other Universities, and scientists and technical staff at Daresbury and Bessy 1 for their help over many years. All were equally important, and experimental science (in the past, present or future) cannot progress without them. Fig. 19. TPEFCO spectra of fluorescence from the C 2T2 state of CF4+ at energies of (a) 21.84, (b) 22.02, (c) 22.20 and (d) 22.36 eV, corresponding to the ν1 = 2, 4, 6 and 8 vibrational levels, respectively. The photon resolution is 0.02 eV, the time resolution 1 ns per channel. The lifetimes of these four levels are 9.0 ± 0.3, 8.6 ± 0.4, 8.4 ± 0.3 and 7.9 ± 0.4 ns, respectively. R.P. Tuckett, P.A. Freedman and W.J. Jones, Mol. Phys. (1979) 37, 379-401. R.P. Tuckett, P.A. Freedman and W.J. Jones, Mol. Phys. (1979) 37, 403-408. A. Carrington and R.P. Tuckett, Chem. Phys. Lett. (1980) 74, 19-23. I.R. Lambert, S.M. Mason, R.P. Tuckett and A. Hopkirk, J. Chem. Phys. (1988) 89, 2675-2683. I.R. Lambert, S.M. Mason, R.P. Tuckett and A. Hopkirk, J. Chem. Phys. (1988) 89, 2683-2690.
and D.M.P. Holland, J. Chem. Phys. (1990) 93, 3295-3306. Meas. Science Tech. (1992) 3, 891-896. T. Baer and R. P. Tuckett, Phys. Chem. Chem. Phys. (2017) 19, 9698-9723. C.R. Howle, S. Ali, R.P. Tuckett, D.A. Shaw and J.B. West, Nucl. Instr. Meth. Physics B (2005) 237, 656-665. M.J. Simpson and R.P. Tuckett, Int. Rev. Phys. Chem. (2011) 30, 197-273. J.C. Creasey, P.A. Hatherly, H.M. Jones, I.R. Lambert and R.P. Tuckett, Mol. Phys. (1993) 78, 837-854. J. Chem. Phys. (1998) 108, 857-868. R.P. Tuckett and P.J. Knowles, Chem. Phys. Letts. (1996) 261, 486-494. P. Jacquinot, J. Opt. Soc. Am. (1954) 44, 761-765. K.J. Boyle, D.P. Seccombe, R.P. Tuckett, H. Baumgärtel and H.W. Jochims, J. Phys. B. (1999) 32, 2569-2582. S. Ali, Ph.D. thesis, (2007) University of Birmingham. M. Peric and S. D. Peyerimhoff, Mol. Phys. (1993) 78, 855-875 and (1993) 78, 877-892. J.C. Creasey, P.A. Hatherly, I.R. Lambert and R.P. Tuckett, Mol. Phys. (1993) 79, 413-424. H. Biehl, J.C. Creasey, D.M. Smith, R.P. Tuckett, K.R. Yoxall, H. Baumgartel, H.W. Jochims and U. Rokland, J.C.S. Faraday Trans. (1995) 91, 3073-3081. M. Stankiewicz, J.C.S. Faraday Trans. (1996) 92, 185-192. O. Warschkow, E. P. F. Lee and T. G. Wright, J.C.S. Faraday Trans. (1997) 93, 53-61. P.A. Hatherly, D.M. Smith and R.P. Tuckett, Zeit. Physik. Chem. (1996) 195, 97-136. J. Chem. Phys. (1994) 101, 10559-10575.